Sam McHorne and her mercenary company the Devil Dogs specialize in bringing down warjacks. Hired to hunt down an warjack of unknown origin in the Wythmoor Forest. the job becomes a race against time as the Dog's encounter a rival mercenary company and the necromantic forces of Cryx. Another good read and worthy of a movie adaptation, so somebody get on that asap. We can Kickstart this. The Devil's Pay is a prelude to Dark Convergence, but it's not necessary to read them in order. There isn't anything that is going to leave you scratching your head in confusion. We also get another story that requires no previous knowledge of the Iron Kingdoms from the reader and like the other books has the glossary in the back if you want to explore it. 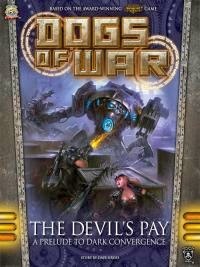 With more characters then the other Privateer Press books I've read up to this point, Dave Gross does an excellent job of getting them introduced and giving you at least some background and development throughout the story. The pacing is good, the combat is well written and when Cryx shows up you get that little shiver of dread going down your spine. I do hope we get more adventures with the Devil Dogs and if Dave Gross is at the helm, I'm all in.